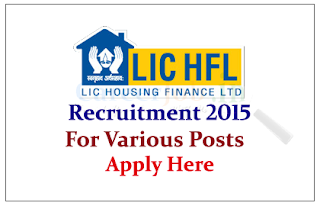 LIC Housing Finance Limited is recruiting for the post of Assistant Manager and Deputy Manager. Eligible candidate can apply online on or before 10thJune 2015. LIC Housing Finance Ltd. is one of the largest Housing Finance company in India. Incorporated on 19th June, 1989 under the Companies Act, 1956, the Company was promoted by LIC of India and went public in the year 1994. The Company launched its maiden GDR issue in 2004. Interested and eligible candidate can apply online on or before 10.06.2015, for more details kindly check official notification.